Why Is Sor Juana Not a Saint? Every hegemonic power in every historical period establishes the limits of what is normal and, consequently, of what is natural. Thus, the power that ordered patriarchal society reserved for itself (reserves for itself) the unquestionable right to define what was a man and what was a woman. Every time some exalted person takes recourse to the mediocre argument that “things have been like this since the beginning of the world,” he situates the origin of the world in a recent period of the history of humanity. Like any system, patriarchy fulfilled an organizing function. Probably, at some moment, it was an order convenient to the majority of society, including women. I don’t believe that oppression arises from patriarchy, but instead when the latter attempts to perpetuate itself by imposing itself on processes that range from the survival to the liberation of human kind. If patriarchy was once a logical system of values for an agricultural system of production and survival, today it no longer means anything more than an oppressive, and for some time now, hypocritical tradition. By the next century, Francisco Cascales believed that woman had to struggle against her nature, which was not only determined but evil or defective besides: “The needle and the distaff – wrote the military man and university professor, in 1653 – are the woman’s weapons, and so strong, that armed with them she will resist the most prideful enemy to tempt her.” Which amounted to saying that the distaff was the weapon of an oppressive system. In 1575,the physician Juan Huarte informed us that the testicles affirm the temperament more than the heart, while in the woman “the organ that is most gripped by the alterations of the uterus, according to all the physicians, is the brain, although there may be no grounds on which to base this correspondence.” Hippocrates, Galeno, Sigmund Freud and the most fanatical supporters of the Boca Juniors soccer team would all agree. The wise and ingenious man, according to the Spanish physician, has a son with contrary traits when the woman’s seed predominates, and no wise child can come from a woman. For this reason, when the man predominates, even when he is brutish and stupid a clever son results. I believe that the idea of the manly woman as virtuous woman is consistent with the tolerance of lesbianism by the same patriarchal system of values that condemned masculine homosexuality to burn at the stake, whether in the Middle East, in Europe or among the imperial Incas. Where there was a greater predominance for matriarchy, neither the virginity of the woman nor the homosexuality of men was watched over with such fervor. A famous woman – beatified, sainted and given a doctorate by the Catholic Church – Saint Teresa, wrote in 1578: “Weakness is natural and it is very weak, especially in women.” Recommending an extreme discipline with the nuns, the future saint argued: “I do not believe there is anything in the world that could damage a prelate more than to not be feared, and for his subjects to think they may deal with him as with an equal, especially for women, for once understanding that there is in the prelate such softness… governing them will be difficult.” But this deficient nature impeded not only the proper social order but mystical achievement as well. Just like Buddha, in her famous book Las moradas the same saint recognized the natural “stupidity of women” that made it difficult for them to reach the center of the divine mystery. It is perfectly understandable that a woman at the service of the patriarchal order, like Saint Teresa, would have been beatified, while another religious woman who openly opposed this structure would never have been recognized as such. I would sum up Saint Teresa’s slogan in just one word: obedience, above all social obedience. Saint Teresa died an old woman and without the martyrdom proper to the saints. 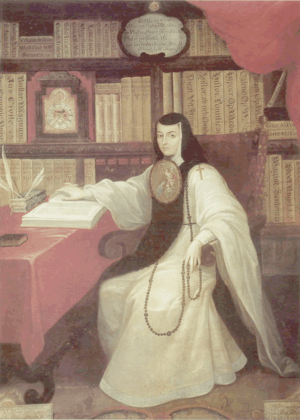 Sor Juana, in contrast, was made to suffer psychological, moral and, finally, physical torture until she died at the age of fourty-four, serving her fellow man in the epidemic of 1695. But none of that matters for canonizing her as a saint when “the worst of all women” committed the sin of questioning authority. Why not propose, then, Saint Juana Inés de la Cruz, patron saint of oppressed women? Those who reject Sor Juana’s religious merits adduce a political value in her figure, when not merely a literary one. In another essay we already noted the political value of the life and death of Jesus, a value historically denied. The political and the aesthetic in Santa Teresa – the “patron saint of writers” – fill her works and thoughts as much as the religious and the mystical do. Nonetheless, a hegemonic political position is an invisible politics: it is omnipresent. Only that politics which resists the hegemony, which contests the dominant discourse becomes visible. When I kiss my wife on the mouth in a public square, I am exercising a hegemonic sexuality, which is the heterosexual one. If two women or two men do the same thing they are not only exercising their homosexuality but also a challenge to the hegemonic order which rewards some and punishes others. Each time a man goes out on the street dressed as a traditional woman, inevitably he is making a – visible – political statement. I also make a political statement when I go out on the street dressed as a (traditional) man, but my declaration coincides with the hegemonic politics, is transparent, invisible, appears apolitical, neutral. It is for this reason that the act of the marginalized becomes a visible politics. We can understand in the same way the political and religious factor in two women as different as Saint Teresa and Sor Juana. Perhaps this is one of the reasons for which one of them has been repeatedly honored by the religious tradition and the other reduced to the literary circle or to the Mexican two-hundred peso notes, symbol of the material world, abstraction of sin. Dr. Jorge Majfud was born in Tacuarembó, Uruguay in 1969. He majored in Architecture and in 1996 graduated from the Universidad de la República in Montevideo. He travelled extensively to gather material that would later become part of his novels and essays, and was a professor at the Universidad Hispanoamericana de Costa Rica and at Escuela Técnica del Uruguay, where he taught mathematics and art. He received his PhD degree at the University of Georgia. He currently teaches Latin American Literature at Lincoln University of Pennsylvania. His publications include: Hacia qué patrias del silencio / memorias de un desaparecido (novel, 1996); Crítica de la pasión pura (essays, 1998); La reina de América (novel, 2001); La narración de lo invisible / Significados ideológicos de América Latina (essays, 2006); Perdona nuestros pecados (short stories, 2007) and La ciudad de la Luna (novel, 2008). His stories and essays have been translated into Portuguese, French, English, German, Italian and Greek. Dr. Bruce Campbell is an Associate Professor of Hispanic Studies at St. John’s University in Collegeville, MN, where he is chair of the Latino/Latin American Studies program. He is the author of Mexican Murals in Times of Crisis (University of Arizona, 2003) and ¡Viva la historieta! Mexican Comics, NAFTA, and the Politics of Globalization (University Press of Mississippi, 2009).